I've read a lot about using zenmai dubbing from the Japanese flowering fern (Osmunda japonica), but I'd never tried it. I recalled seeing similar downy fibers on ferns in the past, and this spring I discovered that the closely related cinnamon fern (Osmundastrum cinnamomeum) has zenmai-type fibers on its emerging fronds. I managed to collect some early this spring and have tied a few flies with it. I don't know how it compares with true zenmai dubbing, but it makes a nice dubbed body, even if it is a little fussy to work with. If you're looking to collect your own "zenmai", you're in luck! 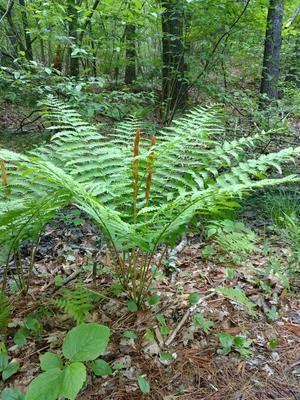 Cinnamon ferns are widespread and common throughout North America. You may even have some in your landscaping! They're most abundant in shady, wet areas, often growing right next to streams. You'll need to look in early to mid spring for the emerging fiddleheads. You can sometimes find some fibers clinging to the mature fronds, but you'll get the most out of the fiddleheads. 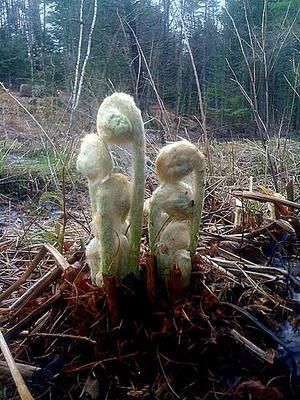 Just be careful not to break off the fiddleheads, as they are very fragile. It's not the easiest material to work with, but it's satisfying to use material you collected yourself. 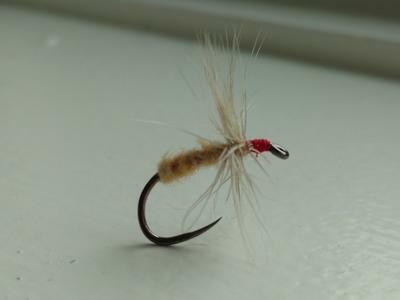 I look forward to using my "zenmai" flies to catch trout from the very stream where I found the ferns. I've only tied two flies with zenmai. I found it way more than "fussy" - somewhere between "incredibly frustrating" and "expletive deleted." What surprised me even more than the thought that the Japanese would actually use the stuff was that the flies I tied with it floated like corks! Maybe there were tenkara "dry flies" after all! When you try the flies, let us know if they float. 20 minutes of fishing over lunch yielded 1 missed strike, and revealed that my cinnamon fern fly sinks readily. I did use a heavy wire hook, so that might be the difference. The wet fibers also become translucent and let the red thread show through nicely. As for fussiness, I had a much better time when I stopped expecting it to act and lie like fur, and accepted there would be gaps in the noodle. And one correction: I should have specified eastern North America. The USDA doesn't show them occurring in the Great Plains or west.